Hi ya'll! I am back from my August hiatus with lots of new adventures. This summer has been just brutal for photography and anything outside. The relative temperatures haven't been as high as some previous summers, but the Heat Index tells a different story. It is usually expressed as the "feels like" temperature and most days it is in the triple digits, even during the morning hours. For example, at the exact moment I am writing this at 10:30 am, the temperature is 88F and the Heat Index is 105F. You don't have to tell me to stay inside when outside it "feels like" 105F (40C). So the strategy has been to go to birding spots late in the afternoon and shoot photos until dusk, or find interesting places I can park and shoot photos for a short time and retreat to the air conditioned vehicle. Of course all cars are air conditioned in Texas! This is one of those park and shoot adventures. There are any number of services facilities to support Houston's oil industry, the marine and port concerns and the constant, ever expanding construction activities. South and East Houston have the lion's share but you can find pockets of commercial businesses almost anywhere. We don't have zoning, ya'll. In fact, we are famous for it. So, industry requires places and workers to build, repair, store and recycle the machinery and parts to keep the prosperity engine running. 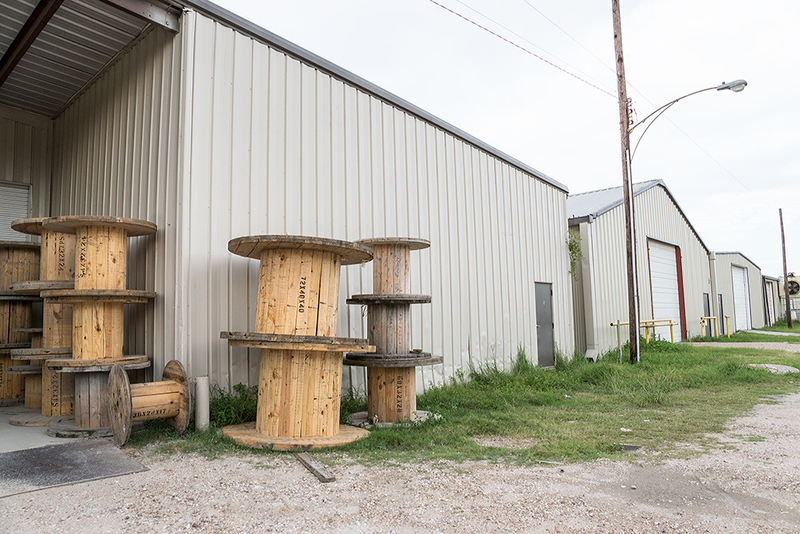 Off Wayside St, south of the South Loop, I found rows of metal buildings and a stash of these wooden spools. The are used and reused to hold wire, cable, and rope. I always laugh when I see them because when I was young, we prized these wooden spools as tables in our cheap and under furnished apartments. They looked great with bean bag chairs and book cases made from concrete blocks and boards. I guess they are in style again, Googling found this Pinterest page. Who knew? I had rather make dreamy time travel photos from them now. These are composites of two photos and some post-processing with Topaz Simplify and Fractalius. Around the corner from the spool place was a giant yard full of marine items. Chains and buoys and bumpers and anchors in various stages of rust and disrepair. I could even see some ancient oil rig escape capsules at the back. Maybe someone will set them up as hotels; seems to be quite popular in some places. It was fenced and guarded by security cameras but a lot of really heavy items were outside of the fence. When I made the above panorama, I noticed something on the rusted machinery in front of the anchor. The spherical things are giant buoys, the white anchors are just huge, but the other looks like some kind of winching machine? You can see a spool with coiled cable in the front and some hand controls at the back. Zooming in, we can see "Jaeger Mach Company Columbus O" After much Goggling I found the Jaeger Machinery Company was in business from 1922 - 1960 and made construction equipment. And I can just bet it employed a lot of people. After even more Goggling, I narrowed this down to a gas-powered drum style hoist and if you want to rent one, check this out. Just down a ways from the machinery were piles and piles of chain. These links had to be over two feet long each; who knows how much each one would weigh? How did they get here? How big a truck would you need to transport a mountain of chain? How long would it take to cut one of the links if you wanted to buy a shorter length? This is an inflatable dock fender with a net of tires. It is used as a shock absorber between ships, docks, platforms and offshore installations. Newer ones might be filled with foam. It is hard to imagine they could sell a used one but who knows? They had several of different sizes. This kind of park and shoot adventure is best done on a Sunday afternoon while businesses are closed and empty. Even then you get some funny looks with big lenses and especially tripods. I love getting out in Houston and exploring the industrial parts of town. Wealth still consists of physical capital as well as all that stuff floating around on the internet. Well, did you miss me? What did you do on your summer vacation? How did you beat the heat? Let me know in the comments.